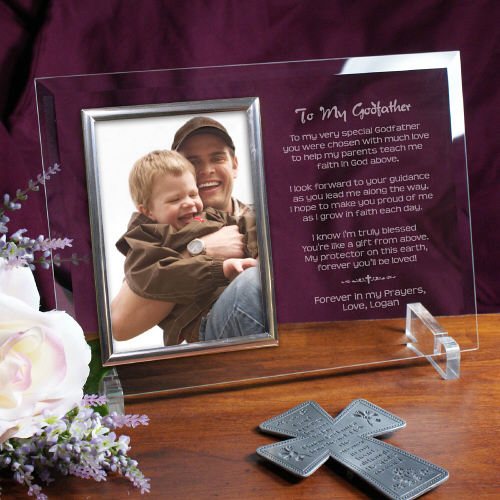 Say Thank You to your Godfather with our attractive Personalized To My Godfather Picture Frame and be sure to include your favorite photo of your little angel to complete this Engraved Godfather Keepsake. Our Personalized Godfather Beveled Glass Picture Frame is a heavy-weight glass with beveled edges on all sides, accented with golden brass frame trim. Frame measures 8" x 11" and holds your 4" x 6" photo; includes clear easel legs for top display. Includes FREE Personalization! Personalized with any two line custom message. (i.e. 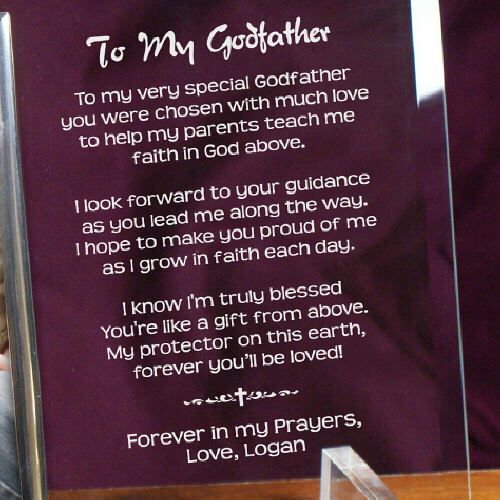 Forever In My Prayers/Love, Logan) Please choose between gold trimmed frame and silver trimmed frame. Frame reads: To My Godfather, To my very special Godfather,you were chosen with much love, to help my parents teach me, faith in God above. I look forward to your guidance, as you lead me along the way. I hope to make you proud of me, as I grow in faith each day. I know I'm truly blessed, You're like a gift from above. My protector on this earth, forever you'll be loved! Holds a 4" x 6" photograph. The product was beautiful and the godparents LOVED it! Such a great choice to remember a special day. Personalized Gifts for your godparents and Personalized Confirmation gifts are some of the personalized gifts offered at GiftsForYouNow.com. We have personalized gifts for all occasions including Christenings, Communions, Confirmation, Godparent Sponsor gifts.